Capoeira Nottingham founded in 2000, and became a Community Interest Company in 2010. We are part of the worldwide group Cordão de Ouro, meaning 'belt of gold'. Our group is dedicated to the promotion of afro-Brazilian culture, and in particular Capoeira: its health, social and educational benefits. We run regular classes for adults and children in the Nottingham city centre, as well as working regularly in various school, college, university and community environments. Our group is a diverse community, with everyone from young professionals, to students, and whole families engaging in what we do, from grandparent to grandchild. 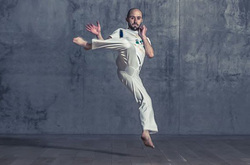 The group holds regular workshops with world-class masters of Capoeira throughout the year. Tatu has been training Capoeira since 2001. He has been teaching in Nottingham since 2008, leading the Nottingham group, as well as running one-off workshops and regular clubs in the many schools, colleges and universities of Nottingham. In January 2014 he achieved his Professor belt. A qualified school teacher, Sansão works extensively with the beginners and children. Originally from Saitama, Japan, Soneca has been training Capoeira since 2005. She achieved her Instrutora belt in January 2014 in Brazil. Soneca primarily teaches Capoeira to our group's children, but has also been involved in projects with the Nottingham Women's Centre, in all female classes.